Late last week, JPMorgan's strategist John Normand announced that the largest US bank "adopted a new baseline that assumes a US-China endgame involving 25% US tariffs on all Chinese goods in 2019" because "the US and China will not resolve their differences this year and that the Administration will make good on its threats to escalate." Such a full-blown trade war "could take $8 off consensus 2019 EPS projections of $179 and reduce next year’s EPS growth from 10% to 5% year-on-year" with JPMorgan predicting that this could "potentially end the US stock market rally even assuming a forward multiple of 17, unless some other offset materializes." 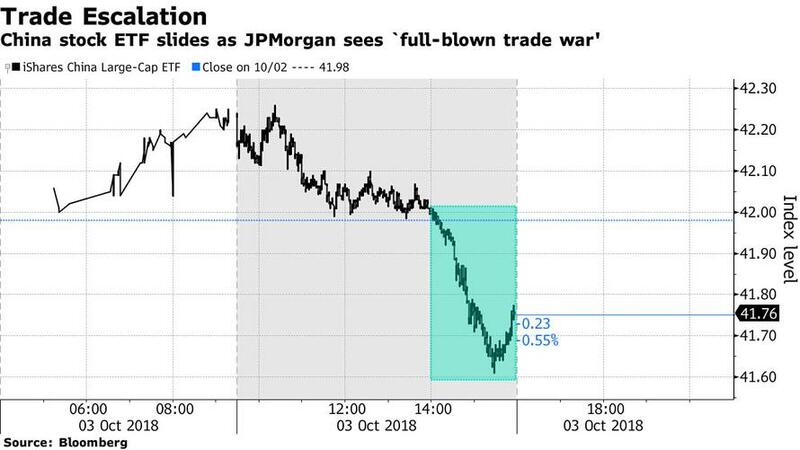 JPMorgan wasn't finished, however, and around 2pm on Wednesday, JPMorgan took its "new baseline" call further when it announced that as a result of its new baseline assumption for a "full-blown trade war" next year between the world’s two largest economies, the bank downgraded its bullish call on Chinese stocks. Echoing what it said previously in the context of US stocks, JPMorgan strategists including Pedro Martins Junior, Rajiv Batra and Sanaya Tavaria wrote that the trade conflict will only escalate as the U.S. maxes out tariffs on Chinese imports, the dollar strengthens and the yuan weakens further. JPMorgan became only the latest bank to downgrade Chinese stocks - which earlier in 2018 slumped into a bear market as a result of trade war fears and a sharp slowdown in China's economy as a result of the crackdown on shadow credit - following similar moves by Morgan Stanley, Nomura and Jefferies earlier this year. Curiously, while JPMorgan slashed its target and earnings estimates for the MSCI China Index which was already down 24% from its peak in January, the strategists still expect the gauge to rebound 8.9% from Wednesday’s close. "A full-blown trade war becomes our new base case scenario for 2019," the strategists wrote in a note dated Wednesday, replicating the language we highlighted over the weekend. "There is no clear sign of mitigating confrontation between China and the U.S. in the near term." JPM also revised its forecast for economic growth in China next year to 6.1% from 6.2%, and said that without accounting for countermeasures such as more fiscal or monetary stimulus, the trade war represents a 1% hit to growth. "Higher tariffs are squeezing Chinese manufacturing’s profit margin, reducing the investment incentive and hiring, which would then drag on consumption via reduced income." Jack Ma’s comments that the U.S.-China trade war could last 20 years, and then this: "When trade stops, sometimes the war starts. So trade is the way to stop wars." What was most interesting from the JPM announcement, is that with Chinese mainland markets shut all week for a holiday, traders took to punishing the iShares China Large-Cap ETF, which dropped to a two-week low in New York as shown below. And, according to some analysts, yesterday's sharp, late day selloff in US stocks may have been precipitated by precisely this sudden reversal in sentiment vis-a-vis China as suddenly the realization that trade war with China is actually going to have stock market casualties.